Zinnias are popular, easy to grow annuals that brighten any summer garden. Producing colorful flowers that bloom throughout summer and early fall, zinnias thrive in full sun and are a low-maintenance but colorful addition to planting beds across the U.S.
Start zinnias indoors from seeds four to six weeks before your last frost date, or direct-sow zinnia seeds in the garden after the danger of frost is gone. It's important to give plants enough space to grow without crowding, so thin seedlings to allow about 6 to 12 inches depending on height. To ensure season-long flowers, sow more seed every two or three weeks until early summer. New plants will produce healthy flower buds when the first plants are beginning to slow their growth and shut down flower production as fall approaches. Water newly planted zinnias frequently during the first few weeks, keeping the soil moist to establish roots. Once roots are established, water as needed. Keep the soil damp but avoid overwatering. Cover the planting area with 3 to 4 inches of mulch to keep the soil moist and weeds at bay. Avoid piling mulch around the base of each plant as too much moisture in that area can promote fungus. 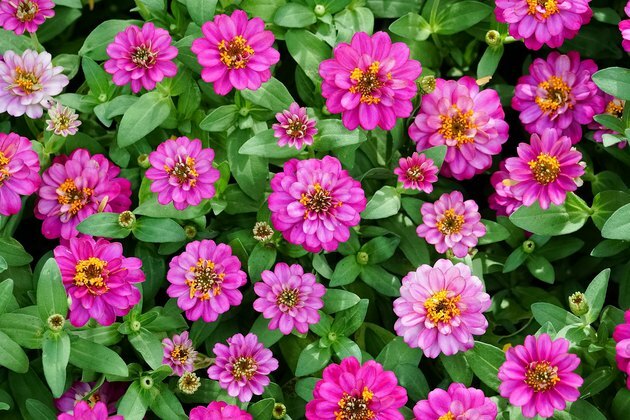 Fertilizing zinnias helps keep new flowers blooming throughout the growing season. Give an initial feeding when seedlings are about 4 inches tall, using a 5-10-5, water-soluble formula. Dilute the fertilizer to 1/4 strength, or 1/4 teaspoon per 4 gallons of water, following all product instructions. Feed again in mid-summer to keep the plants healthy and blooming. Zinnias are naturally bushy plants, especially when grown in full sun. Pinching new growth on young plants will promote branching. Use clean, sharp garden shears to trim back large stems. As blooms fade on zinnia plants, cut these off just ahead of the first set of leaves on the flower stem. This helps spur production of new flower buds on the remaining stems and also helps keep the plant looking tidy. Because zinnias are annuals, they don't survive winter, but leaving a few spent flowers on the plant allows seeds to mature that can drop to the ground. These may produce new, "volunteer" seedlings the following spring. Zinnias are susceptible to several fungal disorders, including powdery mildew which makes leaves look as if they're sprinkled with powder. If not treated, leaves turn brown and dry. Mildew is best prevented by choosing mildew-resistant varieties, spacing plants properly, and watering plants with a soaker hose or drip irrigation that helps keep foliage dry. Zinnias can attract a few pests, including Japanese beetles and foliage-chewing caterpillars. Such pests can slow plant growth and flower development. Whiteflies and soft-bodied, yellowish aphids also can harm flower production. Rid zinnias of these pests by spraying with insecticidal soap, following product label instructions. Repeat as needed.